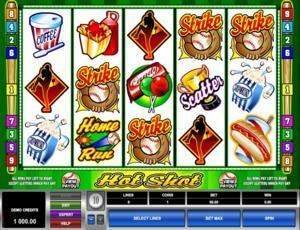 Hot Shot is a fun online video slot game from Microgaming that has been released in November 1999. This online video slot machine game has 5 reels and 9 pay lines. The theme of Hot Shot is all about the exciting sport of baseball. If someone is called a hot shot, then that means he is a very impressive person and he can display his skills flamboyantly. When it comes to baseball, a hot shot means someone who is very gifted and unrivaled. If you ask people who they would first think of when it comes to being considered a hot shot in the baseball field, they would easily answer Babe Ruth. In 1927, Babe Ruth was the first player to hit 60 home runs in one season! Microgaming online slot games are available to players in 2 formats – download and no-download. Whether you like to download their software first or you prefer to play instantly without the need to download, then Microgaming surely has slot games to cater to all of your slot gaming preferences. Since Hot Shot is available for instant play, you can easily find out if you like this game enough to spend money in it. Hot Shot is created for those who love the sport that is baseball as well as for those who love a simple yet entertaining online video slot game. The Hot Shot online slot game features scatter wins, a Wild substitute, a maximum coin jackpot of 1,000, and a maximum cash jackpot of $2,000! Consider yourself hitting a homerun every time you hit winning combinations and win nice payouts in the 5-reel, 9-line Hot Shot online video slot game! The quality of the graphics and sound provided by Microgaming software is definitely superb. They possess an impeccable track record of creating the most high-impact graphics and realistic sound effects. Most people love Microgaming because its online slot games have smooth animation and engaging yet non-intrusive sounds. In Hot Shot, they have really done a great job of incorporating a video slot game together with an exciting baseball game theme. The symbols are drawn in a cartoonish manner, and even if they are brightly colored, you will still love to play for a long time as it does not strain your eyes. The symbols have simple animated programming once you have formed winning combinations with them. The overall graphic design of Hot Shot shows a green background which resembles the baseball field. They used two wooden bats as the background of the line indicators, and two baseballs on the bottom of the reels mark the payout table. The colors used mainly in this game are green, brown and yellow. The constant background sound effects you will hear in this game will make you think that you are at the actual baseball game field, complete with the nonstop cheers and chatter from the crowd. When you form winning combinations, you will hear sound effects such as a ball being hit by the bat and other sounds commonly used in a baseball game. There are no card deck symbols available in the Hot Shot online video slot game. The regular symbols that you will find in Hot Shot are the Home Run, Strike, Batter, Pitcher, Ball Cap, Hot Dog, Fries, Popcorn, Candy, and Coffee. The Wild Symbol is the Wild Ball. The Wild Ball acts as a substitute for all other symbols (except for the Scatter symbol) in order to help you form a winning combination. You are paid certain prize amounts (refer to the Payout table) when you manage to form a winning combination with multiple Wild Ball wild symbols on an enabled pay line. The Scatter Symbol is the Trophy. Scatter symbols mean that they do not need to appear in a line (on an enabled pay line) for you to win. The Trophy scatter symbol can be found scattered anywhere on the 5 reels, and you are able to form winning combinations as long as there are 3 or more Trophy scatter symbols that come out. Your winnings are calculated by multiplying the Trophy scatter symbol combination payout (refer to the Payout table) by the total number of coins you’ve bet. Please take note that if you get a scatter win and a regular, then you are paid out for both of these wins, because the Trophy scatter symbol is not required to come out on an enabled pay line for you to win. The scatter win is included to the pay line win. There are no Bonus Feature games available in the Hot Shot online slot game. Hot Shot has 5 reels where you may bet on 9 pay lines. The minimum bet is 0.25 and the maximum bet is 10.00 per pay line. You can wager only 1 coin per pay line bet. Therefore, the maximum bet amount is 90.00 per spin. Please take note that the amounts mentioned are in Pounds, but they will remain the same if you choose to play in US dollars, Euros, or Canadian dollars. Also, for every coin that you wager, you will enable another pay line. You will be paid out for winning combinations on enabled pay lines only. The maximum payout in the standard Hot Shot online video slot game is 1,000 coins per line bet. People who regularly play online casino games naturally love to stay longer on online slot games that have an Autoplay function. Good thing that Hot Shot is furnished with this function! In Microgaming online slot games, they have 2 game modes – Regular mode and Expert mode. You can have the game spin automatically for you with the Autoplay function that can be found by clicking the Expert button (if you look closely at the brown line at the bottom part of the game screen, you will see the Expert button just below the Bet Max button). After customizing the Autoplay function to your preferences, just click on the Start button, and the game will automatically spin for you while you just sit back, relax, and enjoy playing this baseball-themed online video slot game!